[jg] recently passed some damaged Braille signs and took on the challenge of repairing them. Informed by his recent work on PCB lapel pins, [jg] immediately thought of using circuit boards for this project. He’d noticed that round solder pads made for uniform hills of solder, and this reminded him of the bumps in Braille. He began by reading up on the standards of the Braille Authority of North America, which stipulates a dot height of 0.6mm. He loaded up the PharmaBraille font system and laid it out the dots in photoshop, then and imported it into KiCad and laid out the boards. When the PCBs had arrived from OSH Park, [jg] soldering up the pads (lead free, but of course) to see if he could get the hills to 0.6mm. He’s experimenting with different methods of melting the solder to try to get more even results. Braille interfaces crop up a surprising amount in hacker projects. This refreshable Braille display and keyboard and the Braigo LEGO Braille printer are prime examples. Braille is a tactile system of communication, used the world over by those with vision impairment. Like any form of language or writing, it can be difficult to teach and learn. To help solve this, [memoriesforbecca] has developed Becdot as a teaching tool to help children learn Braille. The device is built around four Braille cells, which were custom-designed for the project. The key was to create a device which could recreate tactile Braille characters at low cost, to enable the device to be cheap enough to be used a children’s toy. The Braille cells are combined with an NFC tag reader. Small objects are given NFC tags which are programmed into the Becdot. When the object is placed onto the reader, the Braille cells spell out the name of the object. Objects can be tagged and the system programmed with a smartphone, so new objects can be added by the end user. It’s a great way to teach Braille, and an impressive build that keeps costs down low. Details are a little thin on the ground, and we’d love to see more detail on how the actuators on the Braille cells work. We’ve seen similar projects before, like this Hackaday prize entry. Share your theories in the comments below. As with all devices meant for a very small percentage of the population, computing equipment for the blind is very, very expensive. A Braille typewriter – a relatively simple machine that puts dots on a piece of paper – costs about $700 USD. Need a Braille interface for a computer? You can buy a 16-cell wide Braille output for $1600, and high-end models with an integrated keyboard go up to $5000. For his Hackaday Prize entry, [Haydn Jones] is building a simpler and cheaper Braille computer. It’s not just a single line of text at a time; this computer will have a display that will output an entire page of Braille at a time. 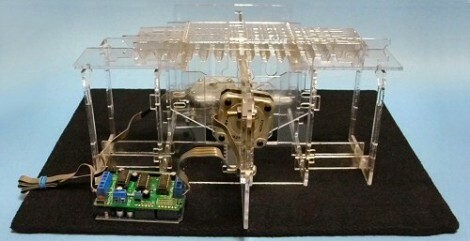 The current solutions for a computer to Braille interface use small electromechanical cells for each character. That’s six individual pins for each character, multiplied by the number of cells on the display. Doing a full-page display with this type of mechanism, but [Haydn] has another idea. Instead of controlling each pin individually, all of the pins on the display will be controlled by a CNC-like mechanism. The pins themselves will be mechanical SR latches, better known as the mechanism in a ball point pen. A display is only half of the IO of a computer, and for the input portion of his build, [Haydn] is also building a Braille keyboard. This doubles as a binary or hexadecimal keyboard, but the idea is very similar to a proper chorded Braille keyboard. It’s a simple enough build; just a few key switches and a microcontroller. Apparently a Braille computer display can cost several thousand dollars. That’s why [David Pankhurst] is working on a low-cost alternative. His offering is an open source version he calls the Audrey Braille Display. The concept is quite good. This prototype has one line of six Braille characters. Each character is made of two sliding strips containing eight arrangements of bumps. These can make up any character when positioned correctly. Two motors do all the work, one engages a single strip to reposition it, the other moves the first motor to select which strip should move. This is explained quite well in [David’s] most recent post. Or you can get a preview of the physical build here. The concept is sound, but the refresh rate must be very slow. We wonder if there’s a way to keep one motor stationary and use solenoids to engage a drive shaft on the individual slide rods? This way, every row could be changed at the same time, disengaging when the appropriate slot is reached. This hardware is much needed until developing Braille technologies actually come to market.